Untethered from the elevated stage of a drift boat, yet buoyed by a semi-submerged inner tube, floating a river is time experienced and time imagined. Floating is an immersion in the lazy immediacy of time experienced ― elapsed, passing, and relative. Floating also means confronting the existential binary state of time imagined ― beginnings or endings. We can only imagine the time that predates and postdates consciousness. We picture the future or conjure images of the past. The story of beginnings is told by procreation in a river fishery and specifically, by the spawning of trout. A female fashions a spawning site on the river bottom called a redd. She prepares the redd by fanning the river stones with her tail to remove lighter sediments. She creates a sediment-whisked oval depression, releases her eggs, and departs. A male follows her to fertilize the eggs. The beginnings are as ongoing and relentlessly continuous as the endings. As there is an ensuing dawn, there is an ensuing nightfall. The story of endings is told by the trout's diet of nymphs and flies. The salmonfly is an jumbo-sized stone fly. It spends several years as a nymph inhabiting boulder strewn riffles before it crawls to the banks of the river after the high flow of spring runoff. The timing of the salmonfly hatch varies and is short-lived. Once airborne the salmonfly's life as a flier might be cut short. 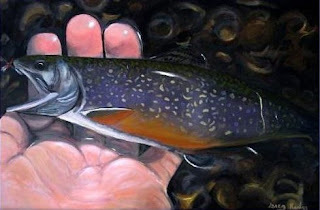 Trout will rise to the surface to strike and consume the calorie-packed insect. "How much time do I have before the take-out point?" It also immersed me in passing time as I began to sense that everything has its own cadence. It is a cadence that is disconnected yet syncopated. In experiencing the of passing time my thoughts toggled between what I was experiencing and the awareness of what I was experiencing. Floating the Madison immersed me in a recognition of relative time. My velocity was different and more directed by topography than the red-tailed hawk drifting on the canyon thermals above me. Time on a river is time experienced and time imagined. "You could see them standing in the amber current where the white edges of their fins wimpled softly in the flow. They smelled of moss in your hand. Polished and muscular and torsional. On their backs were vermiculate patterns that were maps of the world in its becoming. Maps and mazes."